The Titan Laser is the first light-based solution that may help with tightening lax skin. The new Titan Laser gives you an all natural option that may help to actively turn back the clock on aging skin. Using light energy, which may stimulate the creation of new collagen deep beneath your skin’s surface, Titan Laser may tighten skin on your face, abdomen, and legs. It’s an ideal solution that may enhance your youthful and healthy appearance without surgery, recovery time or injections. Dr Sagoo is the first doctor in the UK to use Titan and has appeared on Central TV carrying out the treatment. He has treated hundreds of patients and has also trained doctors on the procedure. The Titan Laser Procedure™ is a safe, comfortable, non-surgical treatment that aims to tighten the skin and reverse the signs of aging by using an infrared light source. The Titan Laser Procedure™ may help with lax and redundant skin throughout the body – including the abdomen, thighs and underarms – and most commonly is used to lift and tighten skin on the face, jowls and neck. In addition, the Titan Laser may stimulate long-term collagen rebuilding that may leave you with younger looking skin. How does the Titan Laser Work? Titan utilises a safe, infrared light to heat the dermis well below the skin’s surface. This heating can cause immediate collagen contraction. During the procedure, the skin’s surface (epidermis) is protected through continuous cooling with the Titan hand piece. After the procedure, there may be new collagen growth, which may result in further tightening and the development of a more youthful complexion with fewer lines, folds or looseness of the skin. The Titan hand piece is applied to the skin. The surface of the hand piece has a device for cooling the top layers of the skin to protect the epidermis from damage. The Titan sends infrared light through the protected top layers of the skin into the deeper layers of the skin, which may cause tightening of the collagen architecture. Because the heat is applied deep within the skin, some swelling and redness may be seen. The procedure itself takes approximately one hour, although the amount of time depends on the size of the area being treated. The Titan is usually used in a series of three sessions one month apart. The results of Titan skin tightening may usually be seen within a few weeks of treatment; however, the full benefits are usually not observed for three to six months. The effects of the treatment are generally not seen immediately, but rather occur gradually over time. The advantage of the Titan over other therma-lifting techniques is that the skin and underlying fat is heated uniformly, avoiding differential heating of the fat; therefore, the risk of dents and atrophy of the skin may be much less likely. Titan employs light energy, because this provides a more uniform distribution of energy for heating the deep dermis than other energy sources such as RF (radio frequency). The biggest difference between the Titan Laser and its RF predecessor, Thermage, is that the Titan is a much more comfortable procedure. Patients have been successfully treated on many areas of the body where skin is lax. Loose skin on the face, jowls, neck, abdomen, knees and back of the upper arm tend to respond well to the procedure. 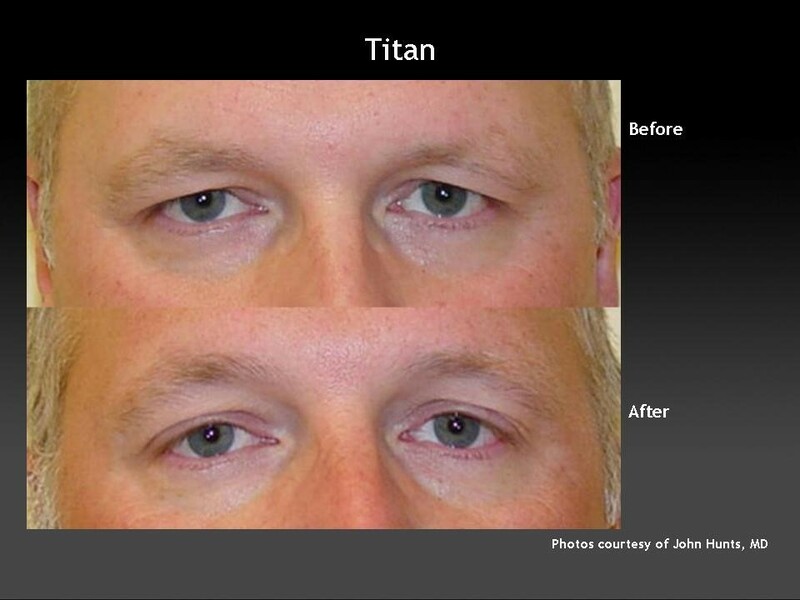 Since the Titan Laser procedure is heating tissue under the skin’s surface, patients of any skin type can be treated. Men and women of all ages have been successfully treated. Dr. Sagoo can advise you if the Titan is right for you. A single treatment has produced good results for many patients. The average recommendation is one to three treatments performed three to four weeks apart. Dr. Sagoo will advise of the the number and frequency of treatments recommended for optimal results. The treatment takes approximately one hour, depending on the size of the area being treated. A topical numbing cream is applied to most patients beforehand to help ensure a comfortable treatment. Immediately following the treatment, you may notice some redness and mild swelling in the treated area. Both will usually dissipate within a few hours. Some patients see results immediately. For most patients, the results are gradual over a three to six month period, as new collagen is formed and the skin tightens. With each Titan Laser pulse, you will feel a brief heating sensation. Some patients are more comfortable taking a mild pain reliever beforehand. Many patients are comfortable without anything. Can TITAN be used with other treatments? You may look years younger! For further information on TITAN and how it is used in combination with other treatments, please call us on 0845 603 6150 for an assessment. The Solihull Medical Cosmetic Clinic is proud to offer the latest in skin tightening using radio frequency waves. It is well known that radio frequency energy can heat collagen fibers to a maximum of 40 degrees, which may give immediate skin tightening of up to 40% and then gradual further tightening over the next six months, with sustained tightening for two to three years. Every patient is an individual, and results vary from person to person. Areas of skin laxity can be greatly tightened in only one treatment in most areas for most patients. To find out more call us on 0845 603 6150.